This is a true story. It is not nice to tell true stories about dead men. With Gods, it is different. They do not die even when they appear dead. Sathya Saibaba’s devotees tell me that he’s never dead. He has already changed the worn-out bodyand donned a new one to reincarnate as Prem Baba. The name means Love Father . There are too many Prem Babas floating around. You only need to find the real one among the maya– illusion – of many. However, it’s usually easy to find a real Baba, god-incarnation. He would have a few white devotees in tow. Presence of a couple of whities attests to a godman’s bona fides. This is an old story. An event that happened some time in 1968 or 69. I have changed the names, except that of Baba himself, and slightly modified the setting to avoid embarrassment to those involved. Sergeant Jeevan Reddy was the leader of the team of NCOs specially selected for installing a sophisticated and newly acquired radar equipment in various Air Force units. Sergeant Narender Verma led the wireless team, entrusted with the work of introducing microwave communication between aircraft and ground controls. Reddy and Verma were good friends; both lived in married quarters next to each other. Reddy was an ardent Sathyasai Baba devotee, as most people from Andhra State tended to be in those days. The supreme God in human incarnation being from their home state gave them some kind of a reflected glory. The Baba only spoke in Telugu – a unilingual god, as most gods tend to be – Krishna liked his prayers in Sanskrit, Allah in Arabic, and Jesus could be best supplicated in Latin, a language he probably did not know existed as he roamed the scorching Arabian deserts. Lots of preparations were required before a team set off to make an installation in a distant military station – checking parts of heavy radar antenna and their complex motors, control and display systems to be packed for assembling upon arrival at site, and ensuring that nothing was missing, briefing by the Operational officer who had never been to a site, talk on security by the absent-minded adjutant, you name it. Sergeant Jeevan Reddy conducted a pooja– worship or homage – in his house the night prior to the date of departure. 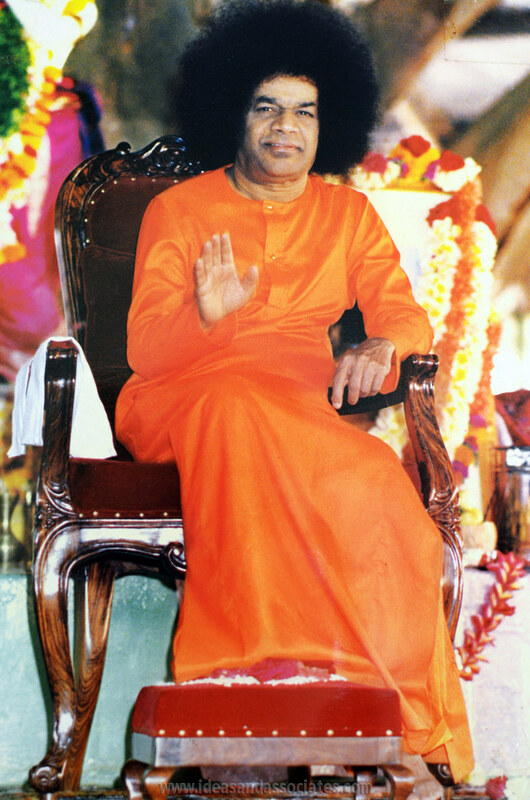 He and his wife prayed in front of of a large photograph of a smiling Sathya Sai Baba in blessing posture, his right hand raised, palm facing the worshipper. Reddy and his wife would pray for his safe travel and also – so Reddy claimed – for the safety of all the team members including that of the grouchy officer who was supposed to be commanding them, but did nothing in practice. The worship involved garlanding the photograph, placing flowers and a small silver plate with God’s favourite special laddoos – sweetened mix of many cereals and coconut gratings rolled in heated butter into balls the size of a tennis ball – for the palate pleasure of the Baba. After the worship, the Reddy’s would go to bed in a state of blissful trance – that is what Reddy once told me. A bronze oil lamp would be kept burning on lw flame all through the night in front of the divine photograph. Everybody knows that gods love burning oil lamps. Next morning, Reddy’s wife would have her private affairs and ritual bath and appear before the photograph. She was not surprised to find a laddoo – or a couple of laddoos – left half-eaten. She would praise the kindness of the God for not eating the whole laddoos, but always leaving some Prasad –leftover after divine consumption – for His ardent devotees. She would mouth a very small piece from the half-eaten part of one laddoo and give another small bit to Reddy who would by then be ready to depart. Sergeant Reddy was a considerate man, and knew that the safety of the team, and hence himself, depended on the blessings of the Baba. Young Mrs. Reddy shared that feeling. So the remaining partly-eaten laddoos were wrapped in an oil paper and carried to the office with great care and devotion. Reddy would break off a bit of the laddoo – not forgetting to show that the bit came from the half-eaten part – and present it, along with a smart salute to the grouchy officer whose frown would momentarily change to one of subtly expressed gratitude and piety. Then the remaining ‘prasad’ (divine pleasure, if you had forgotten) would be distributed among the lesser – and less grouchy – Other Ranks, most of whom accepted it with both palms cupped in reverence, and placed it with shut eyes in their mouths. Thus convinced, Sherif did accept the bit of the divine pleasure and kept it carefullly wrapped up with him for giving it to his wife who had had a miscarriage earlier. Reddy had assured him that Baba would certainly bless him, that He did not discriminate between religions, and in fact, He was the reincarnation of Shirdi Sai Baba, who was believed to be a Muslim. Sherif did not know, or did not care, with the prospect of a calamity of another miscarriage in his mind, that his religion did not take kindly to the idea of reincarnation. On one occasion, Reddy’s neighbour and fellow-Sergeant Narender Verma along with his wife joined the prayer session on the eve of their departure for a joint radar and wireless installation in a distant and somewhat risky part of the Country. Verma carried a packet with him in to the prayer room, which Reddy thought was a gift for the Baba. Just as he expected, Verma placed the packet, unwrapped, between Baba and himself as he sat facing the sacred photograph. Baba loved to accept the humblest of gifts from poor devotees and to gift away Rolex watches and gold rings to richer ones. Bhajans – hymns – that were Baba’s favourites, and then hymns in praise of Baba himself were sung In Telugu and Hindi. Young Mrs, Verma, only two-years married and sadly bereft of a child yet, joined in singing some of the Hindi Bhajans and Aarti, when a brightly lit oil lamp with a long S-shaped handle was circled seven times in front of the photograph. Everyone present sang a Baba-modified parody of a regulation aarti hymn usually sung in temples of smaller gods. It appeared to Mrs. Verma that the Baba beamed even brighter when she took the aarti lamp and circled it with her own hands, earnestly whispering the prayer words under her breath. When the entire ritual was done, and all four worshipers had picked up pinches of ash from a small bowl and touched it to their foreheads, all except Verma stood up. “Get up, Verma, we need to start early”, said Reddy. “Get up, Raja, you need to sleep early to get up early”, said Mrs. Verma. Young North Indian brides addressed their newly-bought (with a dowry) husbands Raja, meaning Prince. After children were born, the Prince was demoted to Billoo’s Daddy, assuming that the child was pet-named Billoo. “I will sit here and seek Baba’s blessings, I have taken a vow,” said a stoic and calm Verma. Reddy said that would be dangerous. Mrs. Reddy had only seen a fleeting shadow through a slit in the door, and she had fever for the next three days. You cannot force a darshan – vision – of Baba by yourself, he explained. If Baba wished to give you a darshan, He would appear before you wherever you might be. There are hundreds of instances, he said, when Baba appeared before soldiers in Leh and Aksai Chin, why, even in Delhi. He recounted an instance when Baba gave darshan to a wounded soldier on Pakistan’s border and healed him while he was also seen at the same time in Bangalore. “You can close the door,” insisted Verma. “Unless you mind my staying in your prayer room for a night”. Of course, said Reddy, how could he stop his best friend and neighbour from staying in his house if he had taken a vow to pray all night? “Close the door and bolt it from outside, if you have to,” said Verma. “I have done it, and I don’t get up in the night,” said a straight-faced Verma. Mrs. Verma nodded, bearing witness to her husband’s claim of not needing to piddle at night. When her pleadings were of no avail, Mrs, Verma went home alone, whispering why the hell her parents gave her away to such an adamant man. She consoled herself that he could be praying for a son or a commissioned rank, or both. Reddy’s retired for the night, switching off the electric light in the prayer room, leaving a single bronze lamp flickering in the dark. , They apologized for leaving him alone, but felt sure in their minds that some untold calamity would befall Verma. The small flame on the lamp projected a black, bouncing shadow of Verma on the wall behind him like an ominous sign of something terrible to happen. In bed, they jointly prayed that the Baba wouldn’t think that they had anything to do with the stupid North-Indian’s impious temerity. “He’s going to get nothing out of this vow,” Reddy assured his wife. “”Except Baba’s anger”.They liked Verma, but that he could get a commission in the military while Reddy rotted in the ranks was unthinkable. With that solace, they held earch other and went to sleep. Half hour later, when all was quiet but for a muffled and rhythmic snore from the Reddys’ bed room, Verma switched on the light and opened his pack. It was an instant polaroid camera. At five-thirty next morning, a reluctant and terrified, but duty-bound Mrs. Reddy opened the door of the prayer room to find Verma seated as before, dozing. He heard her, woke up with an apologetic start, picked up the packet, and stood up. Mrs. Reddy was surprised and somewhat annoyed – you don’t take back a gift that was given to Baba, the one and only Supreme God. “Did you see Baba?,” asked the lady with a shudder. His nonchalance disturbed her. Two laddoos were half-eaten. “Only a fleeting shadow, of course,” said Mrs. Reddy. Too excited to ask more questions that came up in her mind, Mrs. Reddy rushed to announce the miracle to her husband while Verma strolled off to his quarters..
Jeevan Reddy wondered how it was that Baba gave darshan to a not-so-pious Punjabi and not to him, a humble devotee from God’s own native place. For a moment he thought that Verma could be lying. If he was, who ate the laddoos? After getting himself ready for the long journey and hazardous work in a far-away place, Reddy knocked at Verma’s door to ask what exactly he found. Mrs. Verma said her husband had left early, saying he had much work to do before setting off for the distant place. Reddy reached the office, full of pride, excitement and curiosity, with a packet of the prasad, the divinity of which he now had a witness to vouch for. “Did you really, really see Baba?” he asked, just as his wife had before. He bristled with excitement. “In his birthday suit,” said Verma. Verma showed Reddy a photograph of two rats munching on the laddoos. “This was your Baba who bit your laddoos,” he whispered. Verma later told me that he had no intention to embarrass Reddy by showing the photos to others. Reddy stood staring, full of disbelief, anger, feeling deceived by a close friend. Then he broke into a broad smile. He joined his hands and bowed his head before an imaginary image of his god in the disguise of rats..
Reddy’s strange gesture and loud exclamation got noticed; men of all ranks gathered around and had a good look at the Polaroid photo. Some hissed in disgust, others made strange noises in their respective languages..
To Reddy’s bewilderment, nobody accepted the miraculous prasad since then. Nobody, except the grouchy officer.